Nocturnal is the Daedric Prince of darkness, luck, and the night. The patron of the Thieves Guild, she, or rather, her absence, plays a major part in its questline. 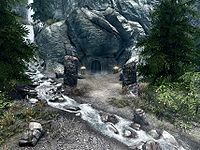 In Skyrim, her shrine lies in the Inner Sanctum of the Twilight Sepulcher, where a portal to her realm from which luck seeps through is kept open by the Skeleton Key. Her influence lends subtle but vital luck, and for this reason, the Nightingales formed within the Guild to protect Nocturnal's shrine and ensure obedience to her will. In exchange for protecting her shrine in both life and death, Nocturnal tips the odds to their favor. Karliah, one of the last Nightingales, will comment on Nocturnal: "She's the mistress of night and darkness and the patron of every thief in Tamriel. Nocturnal isn't one for worship and reverence. There are no priests and no sermons, no services and no alms. She influences our luck and in return demands payment. [...] The only difference is she doesn't demand payment in the traditional sense and sometimes the cost can be quite high. Whether you know it or not, Nocturnal dictates how well we perform as rogues. [...] Haven't you ever noticed how our luck behaves? Like a novice picking an impossible lock or a blind man suddenly turning to face you as you reach for his pocket? It's through these subtle means that Nocturnal influences us. Nocturnal's whim is the greatest mystery to everyone. There have been volumes written on the subject. Does she exact payment when we die? When we suffer does she revel in our misery? No one knows. The return certainly seems worth the risk though." 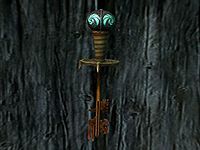 Nocturnal's Skeleton Key has been stolen. As you progress through the Thieves Guild's questline, you'll find out that the Guild's success has been in decline since the last Guildmaster, Gallus Desidenius, was killed. Guild member Delvin Mallory's theory on the decline is assumed superstition: "Somethin' out there is piss-drunk mad at us. I don't know who or what it is, but it's beyond just you and me. We've been cursed. ", but eventually confirmed - Nocturnal's favor has been lost since then. Ultimately, it is up to you to regain her favor by retrieving the Skeleton Key stolen by the traitor Mercer Frey. Karliah will add: "Now it seems Mercer's broken his oath with Nocturnal and defiled the very thing he swore to protect." For more on Nocturnal, see the Lore article. When you've convinced Brynjolf that Mercer Frey's guilty for the murder of the previous Guild Master, you are asked to meet Karliah and Brynjolf outside of Riften at the Nightingale Sanctuary. Once there, Karliah will explain she was, together with Gallus and Mercer, a member of the Nightingales. She will tell you Mercer has betrayed them, and will add: "Mercer was able to unlock the Guild's vault without two keys because of what he stole from the Twilight Sepulcher... the Skeleton Key. By doing this, he's compromised our ties to Nocturnal and in essence, caused our luck to run dry." It is then that she will ask you and Brynjolf to become Nightingales, as she claims: "To hold any hope of defeating Mercer, we must have Nocturnal at our backs. If she's to accept you as one of her own, an arrangement must be struck." When Brynjolf asks her what the arrangement implies, she'll reply: "The terms are quite simple, Brynjolf. Nocturnal will allow you to become a Nightingale and use your abilities for whatever you wish. And in return, both in life and in death, you must serve as a guardian of the Twilight Sepulcher." Later, if you remark that "Religion and thieves make odd bedfellows", she'll tell you that: "This isn't about religion or destiny. This is nothing more than a business transaction between yourself and Nocturnal." "You're already mine, Karliah. Your terms were struck long ago. What could you possibly offer me now?" "I have two others that wish to transact the Oath; to serve you both in life and in death." "You surprise me, Karliah. This offer is definitely weighted in my favor." "My appetite for Mercer's demise exceeds my craving for wealth, Your Grace." "Revenge? How interesting... Very well, the conditions are acceptable. You may proceed." "Lady Nocturnal, we accept your terms. We dedicate ourselves to you as both your avengers and your sentinels. We will honor our agreement in this life and the next until your conditions have been met." "Very well. I name your initiates Nightingale and I restore your status to the same, Karliah. And in the future, I'd suggest you refrain from disappointing me again." When you encounter Mercer in the next quest, Blindsighted, he claims that: "Nocturnal doesn't care about you, the Key or anything having to do with the Guild." After having dealt with Mercer and escaping the ruins, Karliah will ask you to return the Skeleton Key to the Twilight Sepulcher. She'll explain that you'll have to take the Pilgrim's Path and will add: "It wasn't created for the Nightingales. It was created to test those who wished to serve Nocturnal in other ways." Implying that you must take the trip alone, she explains that Brynjolf is needed at the Thieves Guild and admits: "And I... I can't bear to face Nocturnal after my failure to protect the Key." If you tell her you don't understand why she won't come with you, she'll tell you: "I've been a Nightingale for a very long time. I sold my allegiance to Nocturnal in exchange for many profitable years of thieving." She will then admit that she made a mistake by falling in love with Gallus; the pair were so besotted with each other that they failed to notice Mercer Frey's descent into selfishness and all-consuming greed, which ultimately led to his desecration of the Sepulcher. You can then ask her about the Pilgrim's Path in particular: "Even though Nocturnal doesn't desire worship in the traditional sense, the Twilight Sepulcher propagated a small group of priests. Of course, they'd never come into direct contact with Nocturnal but they insisted they had her favor. As part of their "duties," the priests created all sorts of baseless rituals and ceremonies all on Nocturnal's behalf. ", which included the Pilgrim's Path. 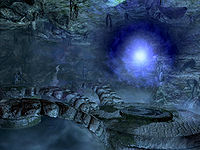 If you ask her about the conduit inside the Sepulcher, she'll explain: "The conduit to Nocturnal's realm, the realm of Evergloam, has been in Skyrim... well, longer than recorded history. The Twilight Sepulcher was constructed around it by man and mer in order to shield it from those who would exploit its power. It's through this conduit that we're given Nocturnal's greatest gift, our luck. What she gains in return is a complete mystery." Once you're at the Twilight Sepulcher, you will find a Nightingale Sentinel, who is revealed to be the former Guild Master, Gallus himself. On the Ebonmere, he will add: "The Ebonmere is a conduit through which Nocturnal influences our world. Not through magic or blessings, but purely through luck. [...] But Nocturnal, she influences our luck; nearly imperceptible assistance we get when we ply our trade. [...] Precisely. There are a few who still call Nocturnal "Lady Luck" and for good reason." My, my. What do we have here? It's been a number of years since I've set foot on your world. Or perhaps it's been moments. One tends to lose track. So... once again the Key has been stolen and a "champion" returns it to the Sepulcher. Now that Ebonmere has been restored, you stand before me awaiting your accolades; a pat on your head... a kiss on your cheek. What you fail to realize is your actions were expected and represent nothing more than the fulfillment of your agreement. Don't mistake my tone for displeasure, after all, you've obediently performed your duties to the letter. But we both know this has little to do with honor and oaths and loyalty. It's about the reward; the prize. Fear not. You'll have your trinkets, your desire for power, your hunger for wealth. I bid you to drink deeply from the Ebonmere, mortal. For this is where the Agent of Nocturnal is born. The Oath has been struck, the die has been cast and your fate awaits you in the Evergloam. Farewell, Nightingale. See to it the Key stays this time, won't you? Nocturnal watches over the Guild once again. She will then return to the Ebonmere, which is when Karliah will greet you: "I'm glad you were able to bring the Key back safely. Nocturnal seemed quite pleased with your efforts." After which you will remark "Pleased? She sounded indifferent." Karliah will explain: "I wouldn't take that to heart. It's her way. Think of her as a scolding mother continually pushing you harder to be successful; outwardly sounding angry but silently content. I assure you, had she been displeased with you, we wouldn't be having this conversation." She will continue to explain the different kinds of Agents you can become, which is when you'll ask her why you can't be all three, after which she'll tell you that: "This is Nocturnal's way of maintaining balance." When you return to the Thieves Guild Headquarters in the Ragged Flagon Cistern, you'll notice a statue of Nocturnal has appeared, a symbol of Nocturnal's favor. When activated, you will be granted the Blessing of Nocturnal, a 10pt boost to your Sneak and a cure for any diseases you may have. This page was last modified on 11 April 2018, at 03:31.